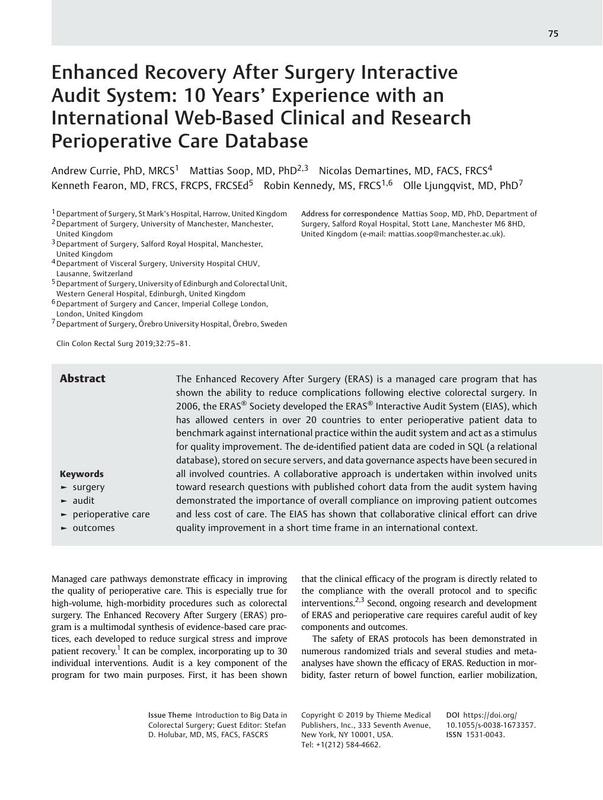 The Enhanced Recovery After Surgery (ERAS) is a managed care program that has shown the ability to reduce complications following elective colorectal surgery. In 2006, the ERAS® Society developed the ERAS® Interactive Audit System (EIAS), which has allowed centers in over 20 countries to enter perioperative patient data to benchmark against international practice within the audit system and act as a stimulus for quality improvement. The de-identified patient data are coded in SQL (a relational database), stored on secure servers, and data governance aspects have been secured in all involved countries. A collaborative approach is undertaken within involved units toward research questions with published cohort data from the audit system having demonstrated the importance of overall compliance on improving patient outcomes and less cost of care. The EIAS has shown that collaborative clinical effort can drive quality improvement in a short time frame in an international context. This article is dedicated to the memory of Professor Kenneth Fearon, who unfortunately passed away during the construction of this article. He was a founding member of the ERAS group and the ERAS Society and his commitment to improving patient outcomes after colorectal surgery has inspired the international evolution of the ERAS project.